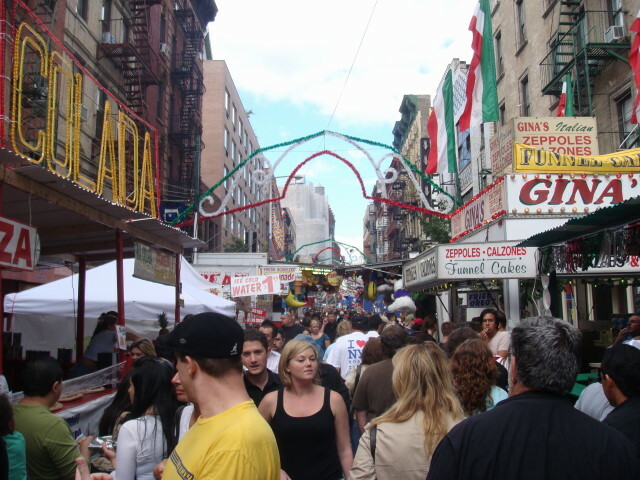 Where Is Little Italy Anyway? Someone’s Confused. I’ve been meaning to post this for a long time. 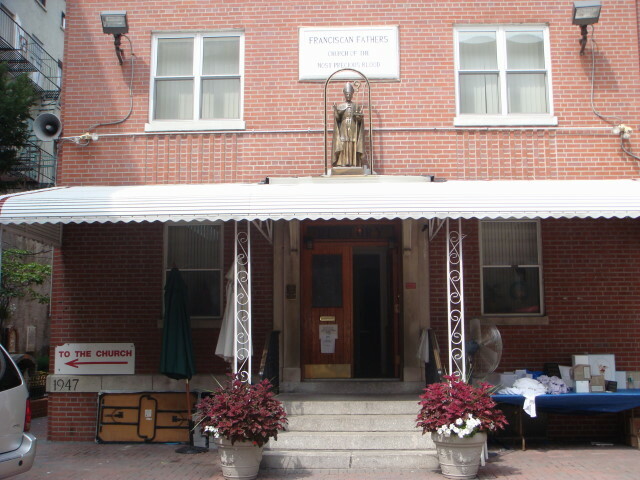 When I go to Church, I often pass this place on 45th. 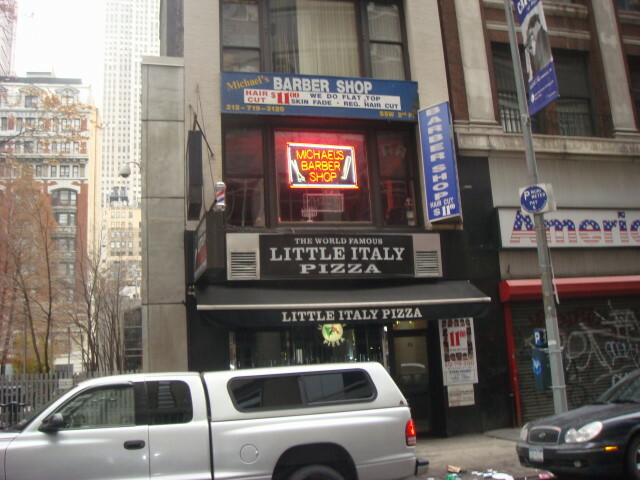 “Little Italy Pizza”? And I always thought Little Italy was below Houston…actually, I know it’s down there. 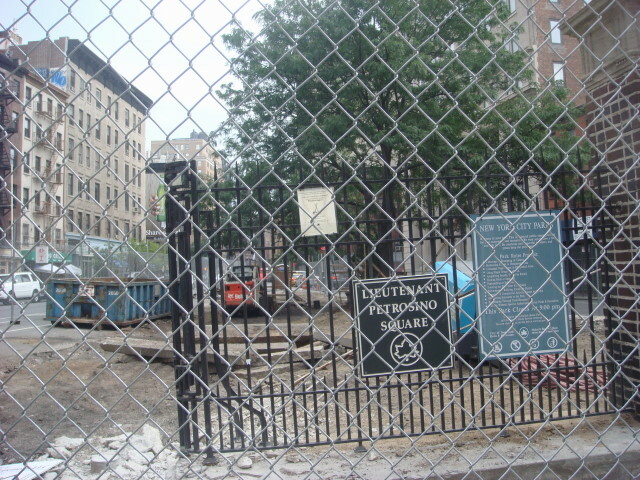 Apparently, the owners of this have been chased out by the encroachment of China Town and want to set up a new neighborhood. And I don’t think it’s a franchise. Just someone who wanted to catch tourists before they got in a cab. 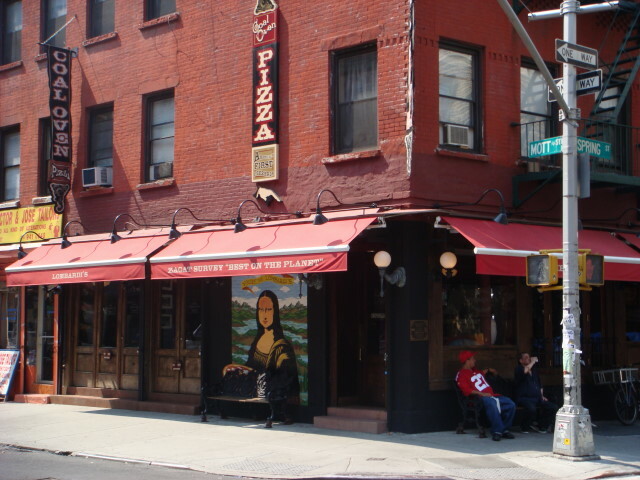 Hail, the conquering pizza: Lombardi’s Pizza! 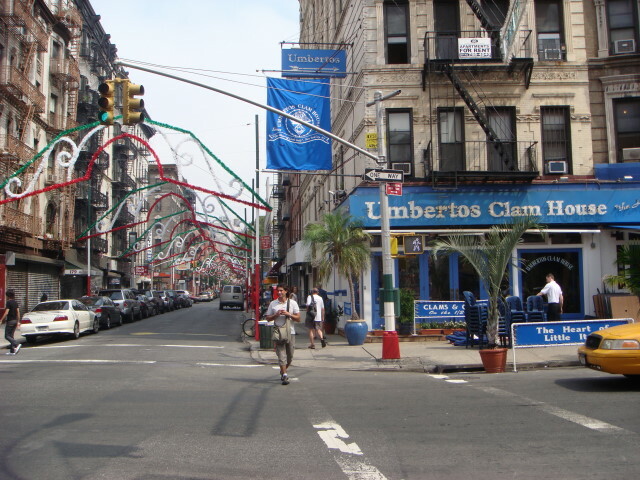 You’ve read my ramblings about the disappearance of Little Italy. 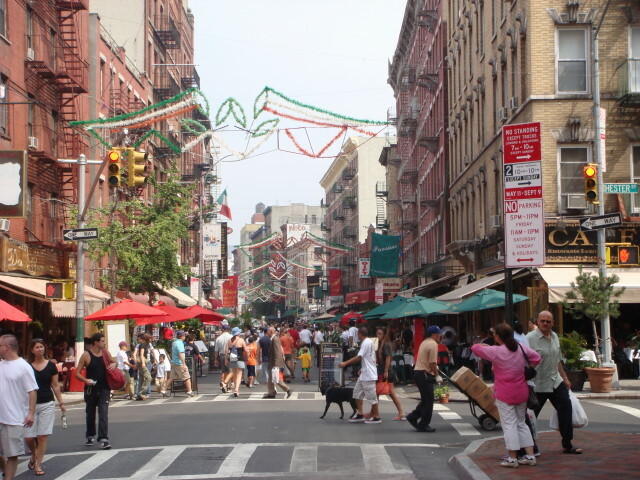 You’ve seen my flat out statements that Little Italy is only parts of Mulberry Street. The problem with flat out statements like that is that there are going to be exceptions. And Lombardi’s is no small exception. 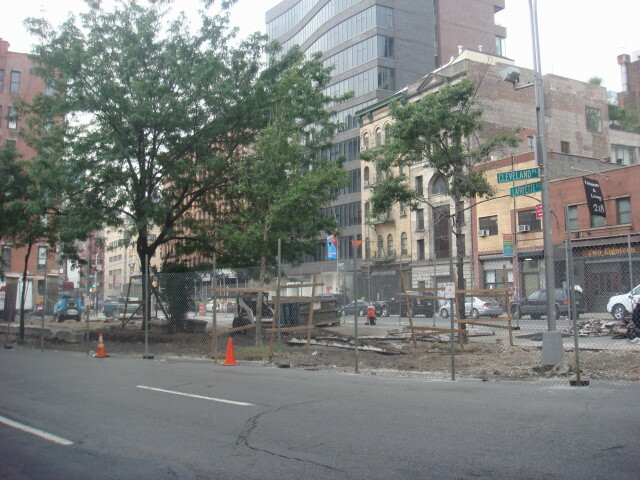 As you can see from the street sign: at the corner of Spring St. and Mott St. That’s old Little Italy. And there are a couple of other places in the immediate area. But, Lombardi’s is the key. When you think Lombardi, you may remember the old Green Bay Packers coach. But this Lombardi is much older and has something that Vince didn’t. 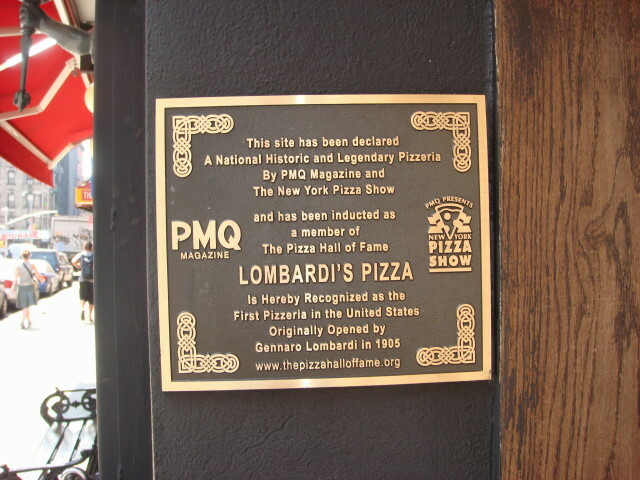 Okay, both Lombardi’s have plaques, but this Lombardi is the FIRST PIZZERIA IN AMERICA!!!!!!! That’s worthy of applause. How could I have gotten through school without pizza? It is simply the most outstandingly magnificent cold pizza ever made by the hands of man. 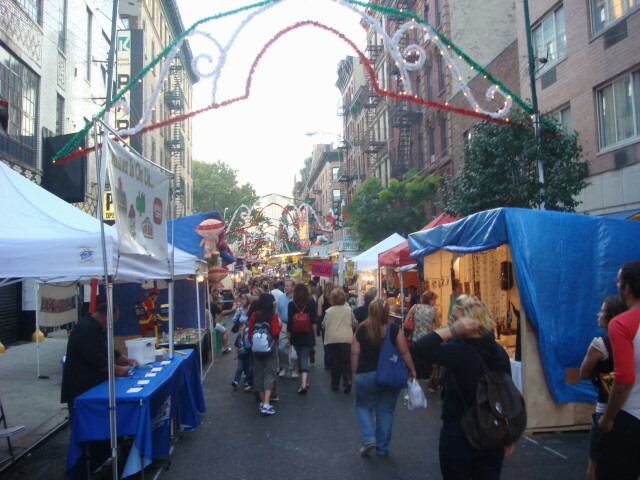 Okay, it’s September, it’s NYC, I’m not Italian; but I’m going to the Feast. St. Gennaro (AKA St. Januarius) is the patron saint of Naples. That’s something I just recently learned and have to admit that too many mafia movies had me thinking of Little Italy only in Sicilian terms. 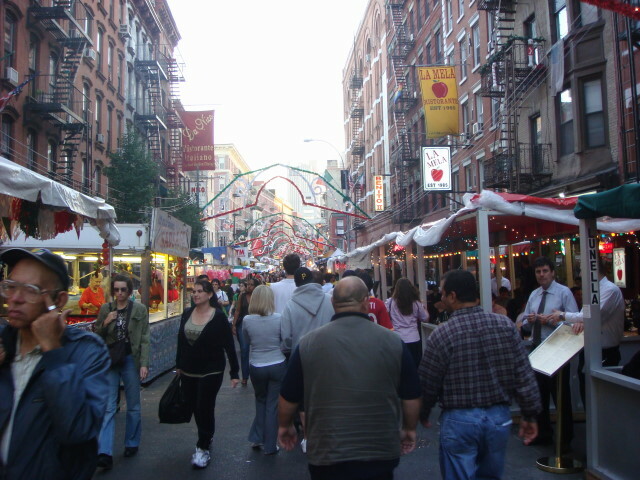 The Feast of San Gennaro is Little Italy’s biggest celebration and is a magnet for tourists and the occasional ankler (your host). I’ve been there over the past couple of years, but each time was at a quiet point at the end of the Feast, so I never got too much of a sense as to how crowded it was. Well, this year, I bested myself big time. 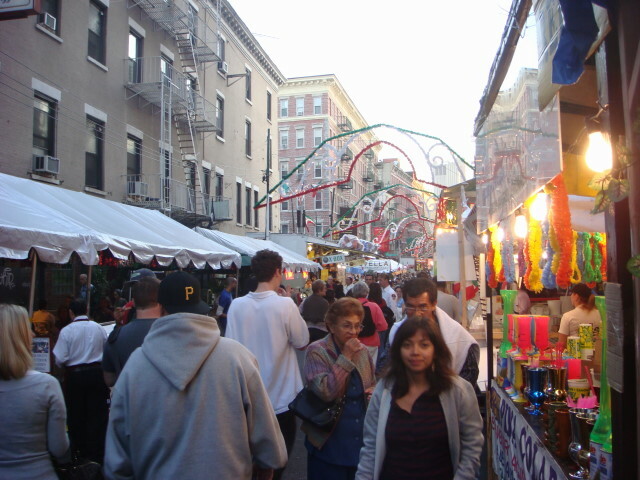 I went there on the first Saturday of the festival and then I went on Wednesday night (the actual Feast Day of San Gennaro). In a word: crowded. 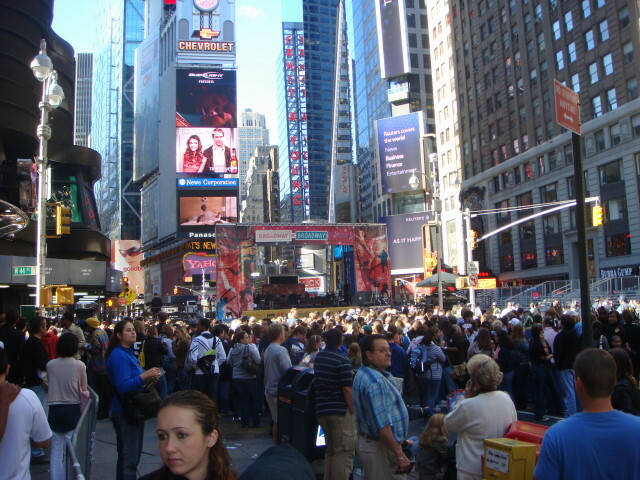 In a few words: really, really crowded…oh, and lots of food and a carnival atmosphere. Here’re some pictures from Saturday. 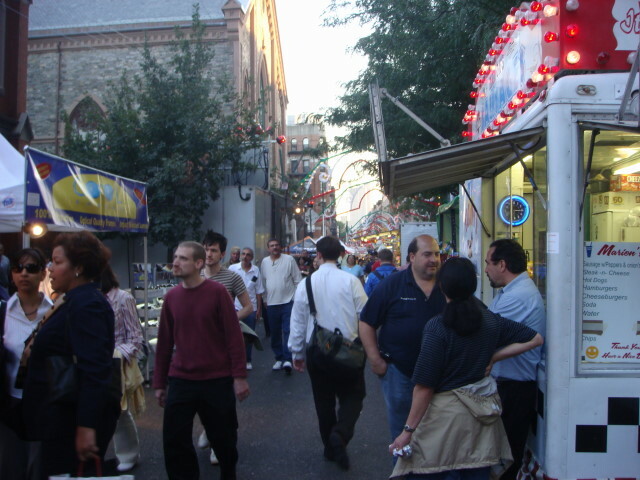 The Feast is held mostly on Mulberry Street and goes all the way from Houston Street in the north (okay, about 20 yard shy of the end of the block) to Canal Street in the South. 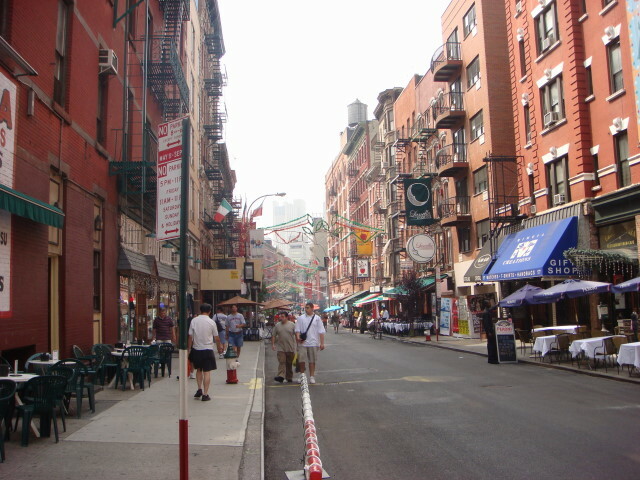 This is traditional Little Italy, although it used to include a couple of other blocks, but which are now mostly Chinatown and a bit of SoHo. Saturday’s crowd was massive. But I suspect there’s a bit of trick to it. Mulberry is a pretty thin street, but they add all the stands to the edges of the street. That makes a thin street even thinner. It would have a crowded feel if there were just a few dozen people and not a couple of thousand (I guess). The crowding drives up the energy, of course. And that’s the sort of thing I thoroughly enjoy. Parts of the Feast are totally dominated by food vendor after food vendor. The best of them are ones that are just extensions of the restaurants. Lots of NYC restaurants dominate the sidewalks outside, but in the Feast they get to take over a lot of the street. As I was exploring on Saturday, I became a bit discouraged with the situation. I kept seeing a lot of standard NYC “street fair” vendors. 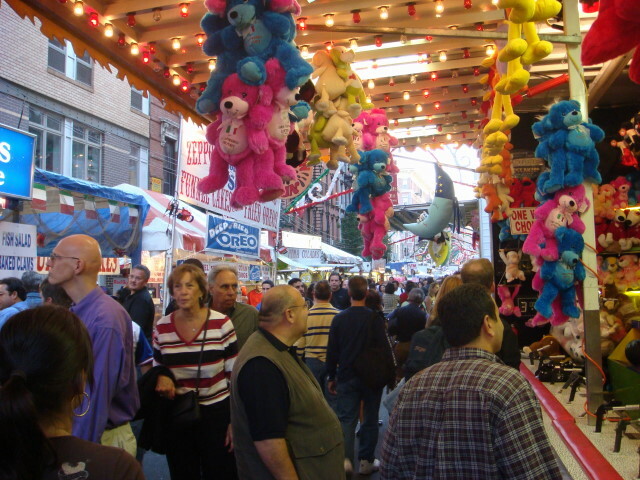 I see street fairs each and every weekend. You wanna buy socks? Wallets? Linens? 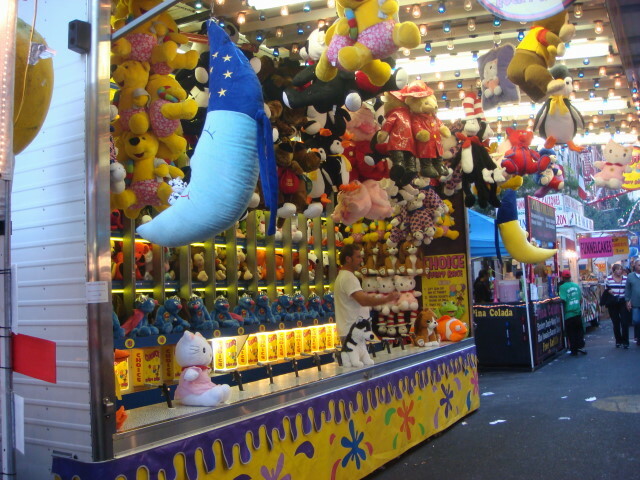 The street fairs have them plus a lot of other boring stuff. 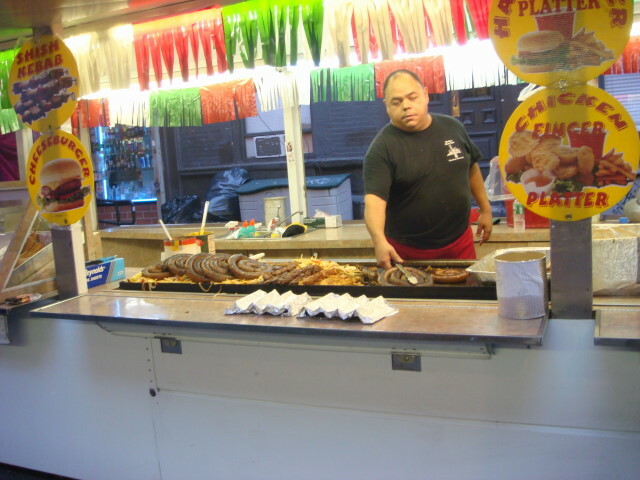 The fairs also have a lot of food vendors, typically dominated by gyro, smoothie, and crepe suppliers. Boring and repetitive and not attractive to me. And I was seeing some of these same food vendors at the Feast (thankfully, no sock and wallet guys). 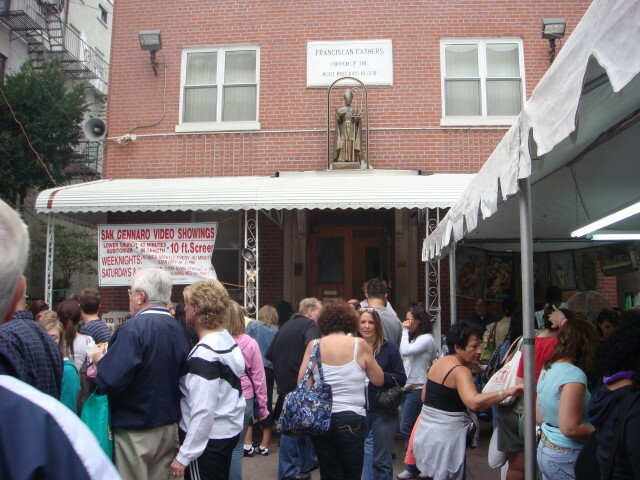 One thing that the Feast of San Gennaro has done that’s warmed my heart is to not have that junk. Instead, they are very ethnic. And, yet here they were. So, I wandered down to the lower reaches of Mulberry and thought I’d check out a bit of authentic Little Italy: the Church. 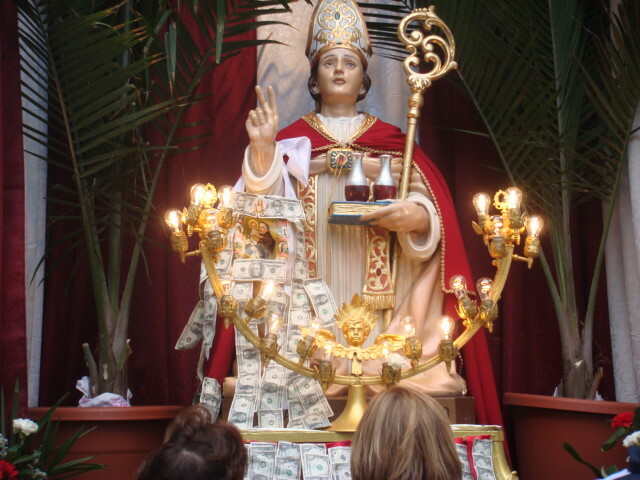 When I’ve seen it before, they’ve had money next to the statue of the saint. This time there was more. I’d seen the bills attached to some cardboard before, but this time it was on the statue. 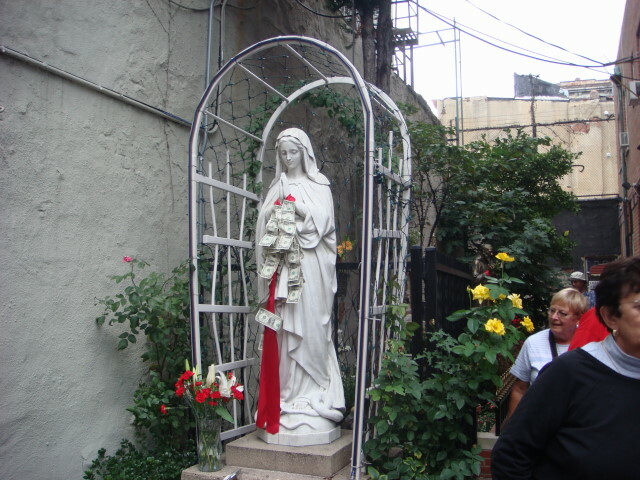 The statue of Mary was similarly bedecked. So, I left on Saturday feeling a little discouraged. The street vendors had busted through and it seemed to be a really nice version of a street fair, but a street fair nonetheless. Lots of games and other stuff for the kids. They didn’t seem to be doing the business they had on Saturday, but fewer kids were out on a school night. That’s fine with me. One character I certainly didn’t see on Saturday. Two snakes, one iguana, and two parrots. I would have noticed him Saturday, don’tchathink? And there was food. And more food. And a bit more. And after that, more food. 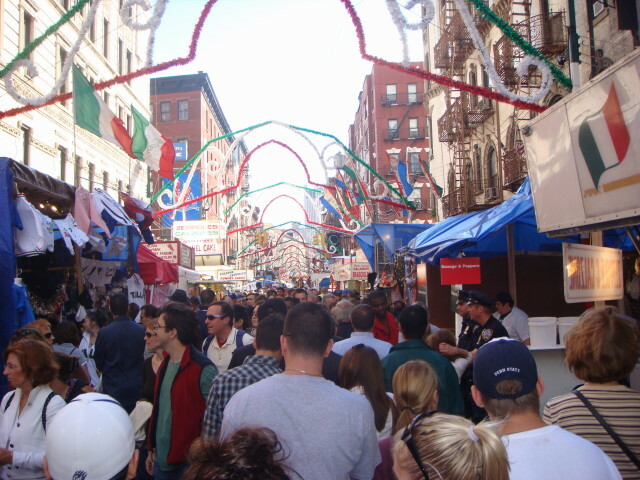 The mainstay of the Feast of San Gennaro is? 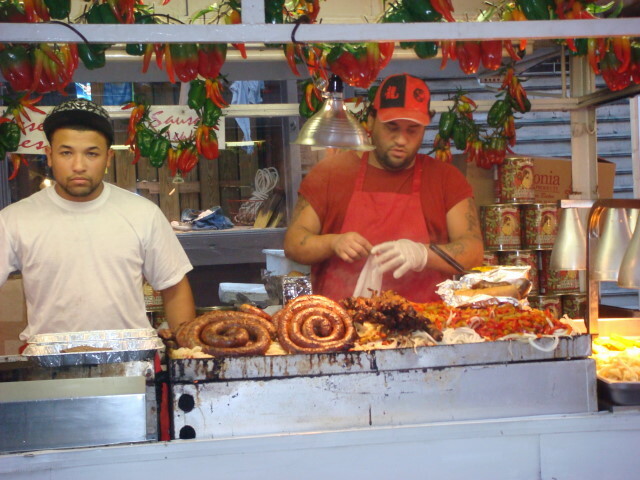 (Answer: sausage and peppers!) It’s everywhere. But don’t let the “peppers” fool you. It’s about 95% onion. They’ll put a few bell peppers on the top, but it’s onions all the way down. Okay, what do you think this guy is selling? 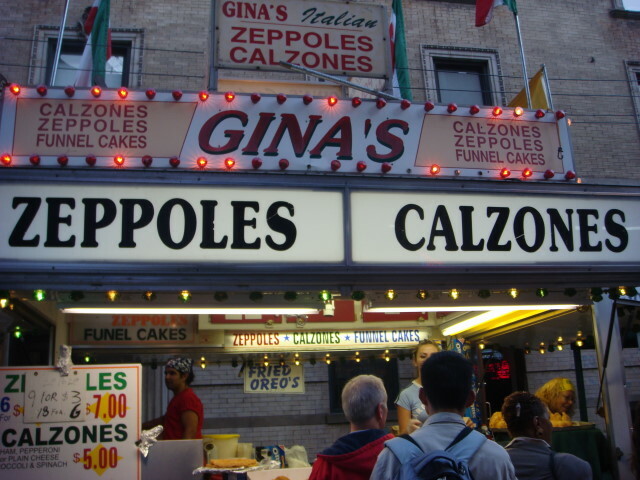 It’s the other mainstays of the Feast: zeppoles and calzones. 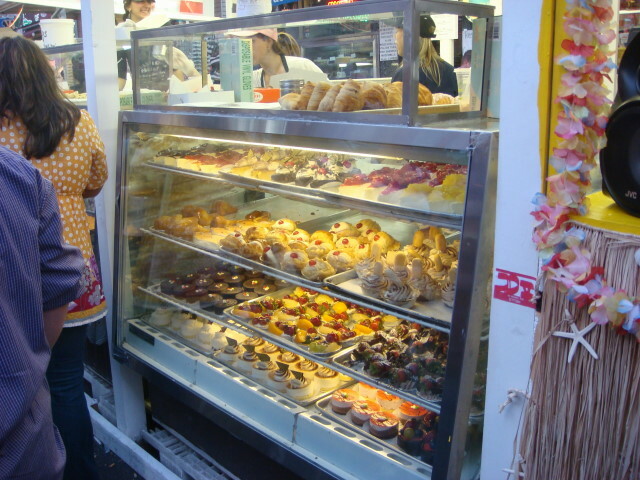 Now, zeppoles are a mainstay, but they ain’t the only choice for dessert. The above is just one of many. The cannoli people are everywhere, too. I love me a good cannoli. The Feast doesn’t cover a big area, but it covers the area it does have very tightly. I do enjoy it and am delighted that my initial concern didn’t hold for the whole Feast time. I haven’t mentioned that it does encompass parts of some of the sidestreets, but it does. And I’ve saved the “worst” for last. Everyone reading this blog who has been to the Feast is wondering when I’m going to mention him. Drown the clown. Or, drown the insulting clown. 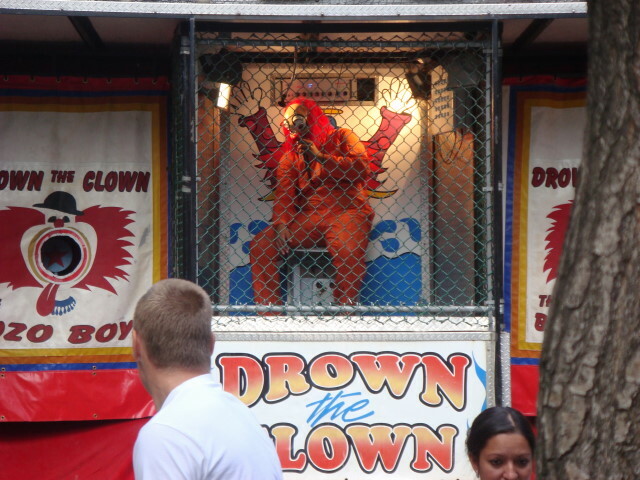 He’ s a clown figure who sits in a dunking booth and spews out minor insults to passerbys, or more directly at the people who are throwing baseballs at the lever to send him into the water. As I was walking nearby on Saturday, I was right behind a family and the kids saw him and got excited. “Mom” said something like “Oh, your father can’t stand him” and “Dad” responded “He always makes fun of my nose.” The kids laughed and the last I saw they were on their way to try to drown the clown. 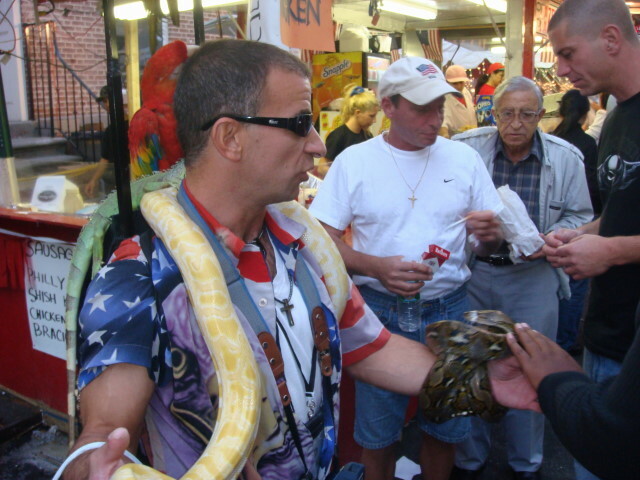 Okay: three parades, one protest, and the Feast of San Gennaro. That’s a heavy weekend for Famous Ankles. I even had to give up on “Broadway on Broadway”. 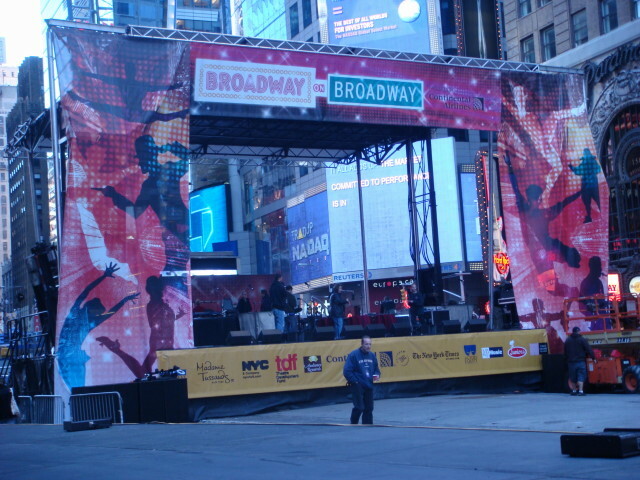 But here’s a few pictures of the preparations at Times Square. I passed there on the way to Church this morning (we had 12). This next one is right after Church. It was filling up fast, but probably didn’t start for a couple of hours. 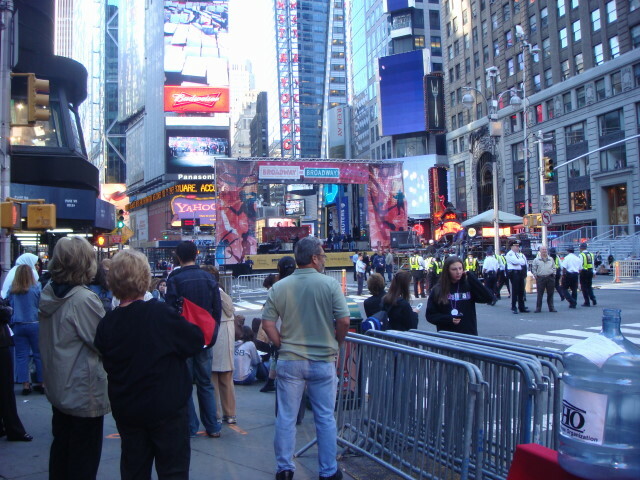 Excepting Broadway on Broadway, I went to ’em all. It’s going to take a day or two to come up with the reports, so hold on.